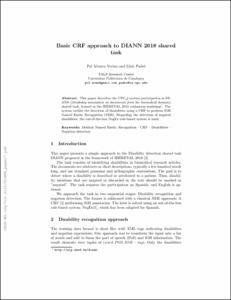 This paper describes the UPC 2 system participation in DIANN (Disability annotation on documents from the biomedical domain) shared task, framed in the IBEREVAL 2018 evaluation workshop1. The system tackles the detection of disabilities using a CRF to perform IOB Named Entity Recognition (NER). Regarding the detection of negated disabilities, the out-of-the-box NegEx rule-based system is used. This paper describes the UPC 2 system participation in DIANN (Disability annotation on documents from the biomedical domain) shared task, framed in the IBEREVAL 2018 evaluation workshop1. The system tackles the detection of disabilities using a CRF to perform IOB Named Entity Recognition (NER). Regarding the detection of negated disabilities, the out-of-the-box NegEx rule-based system is used. © 2018 CEUR-WS. All Rights Reserved. Alvarez, P., Padro, L. Basic CRF approach to DIANN 2018 shared task. A: Workshop on Evaluation of Human Language Technologies for Iberian Languages. "CEUR Workshop Proceedings". 2018, p. 61-65.